My father was a cat lover. In his rare recounts about his childhood, once he told me that he went to someone´s house and saw so many cats that he had never seen before. "Wherever my eyes rested, there was a cat". He lived on a farm his whole life, so I questioned about him not having cats. "Yes, we had one or another, but when we had kittens, my parents would get rid of them. After he became owner of his own farm, he raised as many cats as they would be born or would show up here. My sister and I thought him to be abused by the cats as they would crawl all over him even when standing up chopping onions for dinner. 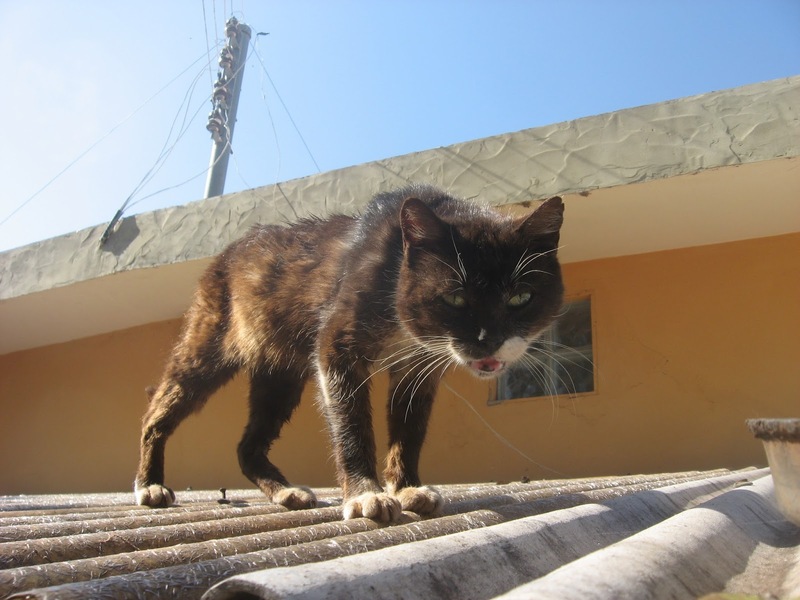 The one on the photo is a male cat, about 6 years old, that used to jump into my father´s office seat. They used to share the same small cushioned chair. He said "Look at this cat: he is pushing me out from the seat. I have only the tip of it to sit on." And my father didn´t shoo him. He would let him sit there as if he was the master. About 10 days after my father passed away, Meow Cat ChooChoo (name given my his grandchildren)disappeared. He made one or another brief appearance once or twice, but was away for whole 2 years. 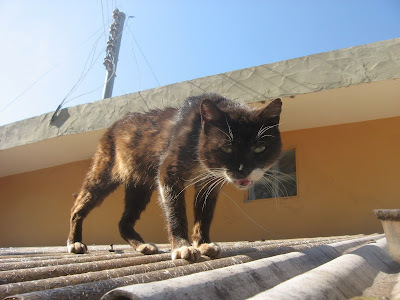 Last June, about 10 days after my father´s death anniversary, ChooChoo sneaked into the house and would ran away at our presence. Even though he was a bit scared, he would come to eat the best leftover food we reserved for him. I caught and took him to a vet to be treated for some respiratory problem. After he took all the antibiotic pills, he disappeared again for weeks. ChooChoo showed up again a few days ago all beaten up with his black hair all redish. I said to my daughter that he may have gone to my neighbor´s hairstylist, as the girl got few strands in a weird burned red color, indicating a bad job. So hard to pick him up, to give him medicine, to keep out of the house that this time I am not taking him to the vet unless his coat gets worse. Am I a Real Expat?